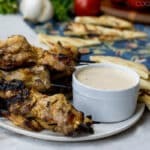 These Indian spiced grilled chicken kebabs are marinated in yogurt and have a spicy, creamy yogurt dipping sauce to serve on the side. 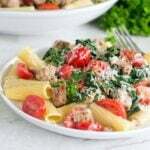 This recipe was developed for Stonyfield Organic. To see all of my Stonyfield yogurt recipes click here. I’ve thought about making my own yogurt at home. I’ve heard it’s not that difficult, no stomach carrying case required. But usually when I think about it I decide that it’s easier to buy some of my favorite organic yogurt, Stonyfield of course, from the grocery store. Which is what I did to make these yogurt-marinated grilled chicken kebabs and the yogurt sauce to dip them in. Ever since back when I made this Pasta Carbonara with Greek Yogurt, I’ve loved incorporating yogurt into savory dishes. The creaminess and tang are perfect with so many things. I especially love adding a bit of spiciness to dishes with yogurt since the yogurt cools and balances it really nicely. There’s a bit of spicy zing to the yogurt sauce in this recipe but my kids haven’t seemed to notice and I’m not going to mention it to them. These kebabs are a perfect lunch or appetizer for a sunny summer day. I like to get the chicken marinating in the morning and then grill them up in the afternoon for a snack when we get back from the park or come out of the pool or serve them as an appetizer when we have friends over for a BBQ. 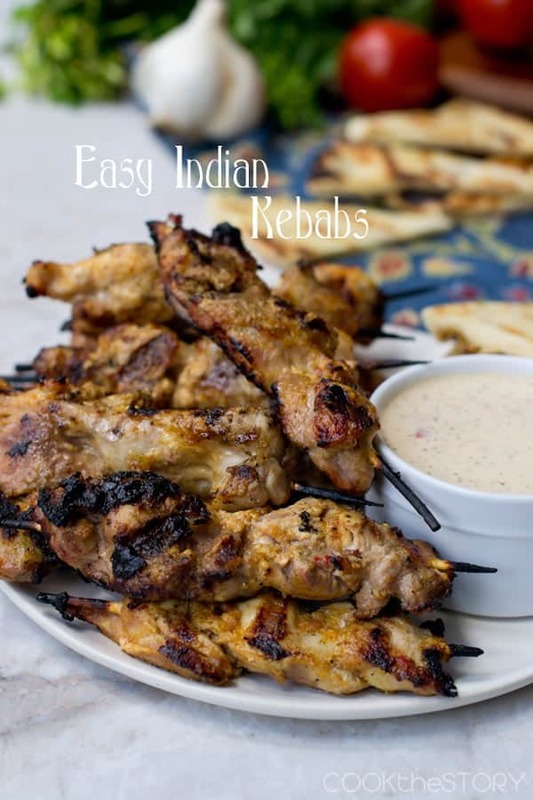 To make these Indian-spiced grilled chicken kebabs you put a lot of onion, garlic and some red chili in a food processor with cumin, curry powder and yogurt. Then you pour half of it over skewers of chicken. Let the chicken marinate for at least an hour. To the other half of the yogurt mixture in the food processor you add tomato, cilantro and salt and puree it some more. Then stir in extra yogurt. This will be a dipping sauce for the chicken kebabs. Cover and refrigerate it until your chicken is cooked. The chicken is then grilled over direct medium heat. 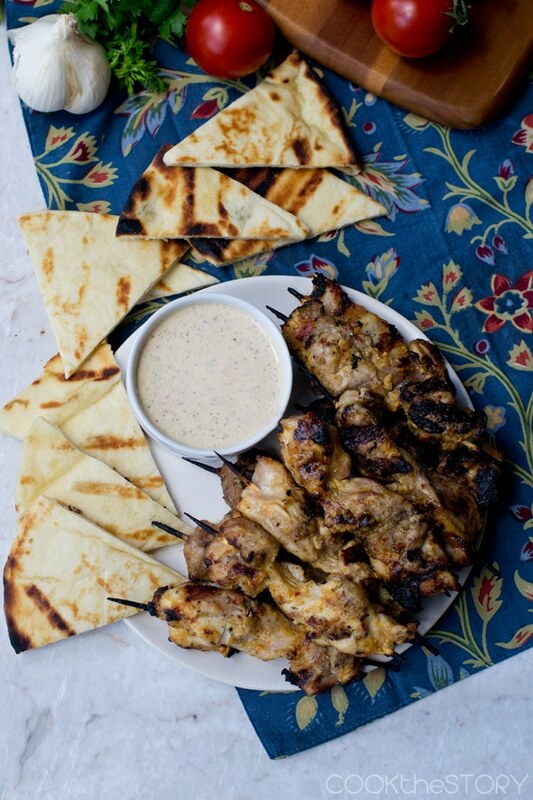 When it’s done you serve it with the spiced yogurt sauce and some grilled flatbread (naan or pita) on the side. Or you can even fold the chicken into flatbreads and add the sauce in there to make wrap sandwiches. Super-easy to make. No curdling milk in animal stomachs required. 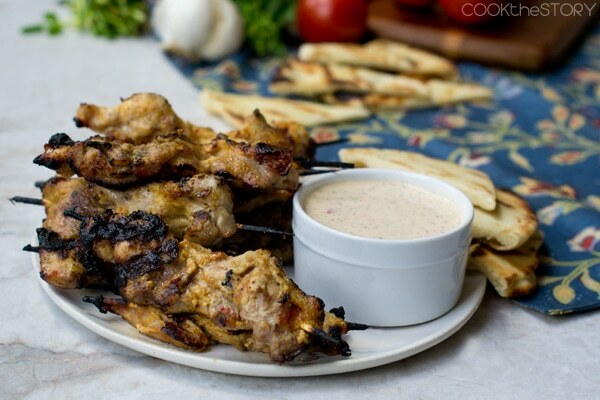 And now, here’s my Indian-Spiced Grilled Chicken Kebabs with Yogurt Sauce recipe. These easy Indian-spiced grilled chicken kebabs are marinated in yogurt and have a spicy, creamy yogurt dipping sauce to serve on the side. I like to grill some naan bread and cut it into wedges to serve with it as well. Fill a large pot or sink with warm water. Add the skewers. Into a food processor put 1 cup of the Greek yogurt and the onion pieces, red chili, garlic, cumin and curry powder. Puree until smooth. Poke each chicken thigh all over with a fork. Unroll a thigh on a cutting board. Cut it in half lengthwise so that you have two long strips of chicken meat. Thread each strip onto a wet skewer and put them into a 9"x11"pan. Repeat with the remaining chicken thighs. Pour HALF of the yogurt and onion mixture from the food processor over the chicken skewers (set the remaining mixture in the food processor aside. It will be used to make a sauce). Turn the chicken skewers to coat them. Cover and refrigerate for at least an hour but up to 12 hours. Meanwhile, squeeze some of the juice out of the tomato pieces and then add them to the yogurt and onion mixture in the food processor. Also add the cilantro and 1/2 teaspoon of salt. Puree until smooth. Gently stir in the remaining 1/2 cup of yogurt. Cover and refrigerate the sauce. When ready to cook the chicken, preheat grill for medium direct heat grilling. Sprinkle the chicken on all sides with salt. Put chicken skewers on the grill and let them sit until nice grill marks appear on the undersides, about 3-5 minutes. Flip. Continue to cook the chicken, flipping occasionally, until cooked through, about another 5-7 minutes. Remove from grill and serve with the chilled yogurt sauce. *The info about the origins of yogurt from the top of this post is from The Dairy Goddess. 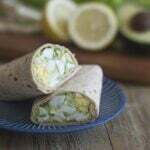 Disclosure: I’m a Brand Ambassador for Stonyfield Organic, meaning that they compensate me to develop recipes that use Stonyfield yogurt and to promote the recipes and their products in my blog posts and social media. All opinions are my own. I made this for dinner last night and did not use the grill I just popped them in the oven. I also used breast meat. This recipe is VERY GOOD!!! I will be making it over and over again! I even shared with others that are eating healthy because every ingredient was allowed in our food list. I have been looking for a dipping sauce for celery and this will be my dipping sauce for a lot of foods!! These look so good Christine! I’m newly in love with Indian spices and can’t wait to try these! I admit to having an unjustified fear of Indian cuisine. I had a neighbor once who always cooked Indian cuisine, but went overboard with the spices and made the halls of the apartment complex smell nasty. I really need to step outside of my comfort zone and try this. It looks fabulous! Such a nice dip! I bet it would go great with grilled summer vegetables as well. I’m cracking up – I have a very similar Indian spiced chicken recipe coming up next week! Great minds think alike! LOVE that you added the chili!! This looks so good! My husband is crazy about Indian food. 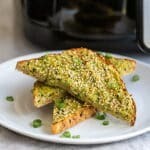 He will love this recipe! I like that you actually grilled the naan bread also. Yum! This recipe is so full of flavor I can practically smell and taste it through the screen! Lovely recipe, going to save for dinner real soon! I am in lurve with this recipe! Indian flavour are my fav, and after a bad Indian restaurant experience yesterday, and I am still mega craving some Indian food! How did you know?! ;) Pinned!